There are many healthy berries you can add to your diet. 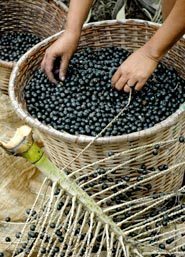 The acai berry is one of the healthiest berries you will ever find. Acai is an indigenous berry found in the rain forests of the Amazon. This fruit has been heralded for centuries as a healing, immune-stimulating, energy-boosting fruit. Research reveals this antioxidant-rich berry may help suppress and repair oxidative damage. Let’s take a look at twelve health benefits of acai berries. Similar to red wine, research shows that acai berries are extremely high in anthocyanins, a type of antioxidantthat supports balanced cholesterol levels. They are also rich in plant sterols that provide cardio-protective benefits, including supporting circulation, improving overall blood composition, and relaxing the blood vessels.